The Mount Work Hartland Bike Trails lie on the western slope of Mount Work in the community of the Highlands, one of thirteen communities that form the Capital Regional District of British Columbia. Located on the southern end of Vancouver Island this section of Mount Work Regional Park was designed for mountain biking. Mt Work Regional Park has numerous and diverse mountain biking trails on its eastern slopes that have been in developed over the past thirty years. The cycling trails extend the entire length of the eastern portion of the park from the Ross-Durrance Road to the southern corner of the park near Eagle Lake. Ride on wide fire roads to single tracks through the Douglas-fir and arbutus forests. The mountain bike areas fill the eastern slopes the Mt Work Regional Park and extend well outside the area marked on the Capital Regional District brochure. The trails are maintained by volunteers with the South Island Mountain Bike Society who have placed colored markers at trail junctions to alert riders to changes in difficulty of the route ahead. 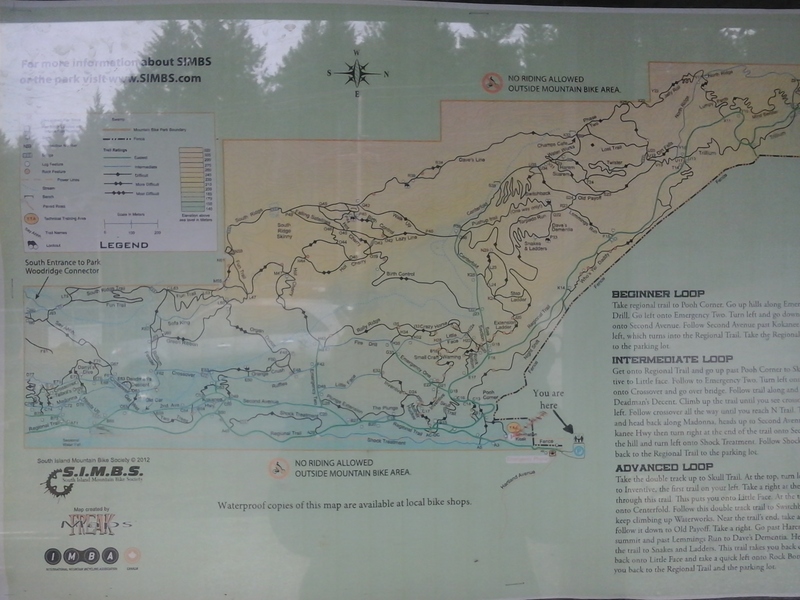 They have also produced a useful map, carried by many bike stores, to help your safely navigate the terrain with some easy slopes and plenty of difficult grades. This popular parkland provides some of more extensive biking trails in the Highlands and Victoria area. The trail head off of Hartland Road, right next to the landfill site, has toilets, air pump and bicycle washing station. Mount Work Hartland Bike Trails can be reached from the Trans Canada Highway (Hwy1). Exit onto McKenzie Avenue and continue along to reach the Pat Bay Highway (Hwy17). Follow Hwy17 to the Royal Oak Drive exit and turn to cross over the overpass. At the junction with West Saanich Road turn right and follow along looking for signs for the Hartland Landfill. Turn left at Hartland Avenue follow the road until you almost reach the landfill. Look for the signs and the gravel parking area to the right. The trailhead has washrooms and a technical training area for cyclists to warmup and practice. For a map of the mountain biking trails in Mount Work Park, visit a local bicycle store to purchase a brochure.